October 29th, 2015, Tor announce a Beta release of Tor Messenger, an new instant messaging client that anonymize your conversation. This new tool is based on InstantBird, a messaging client of Mozilla community. 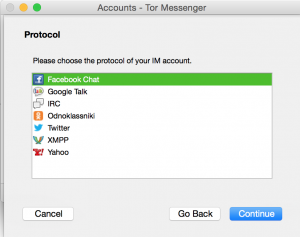 Tor Messenger is available for free download for Windows, OSX and Linux plateform. The main objective is to provide an higher level of security by default when you using your favorite chat networks. It aims to be secure and sends all the traffic over Tor Network. Currently, it support a wide variety of chat network including Jabber (XMPP), IRC, Google Talk, Facebook Chat, Twitter, Yahoo and others. Tor Messenger builds on your familiar networks, so that you can continu communicating with your contacts. It permits to hide your route to the servers because your are communicating over the Tor network but all metadata, specifically the relationship between contacts) can always be logged by the server. Tor community is currently working on a solution to fix this problem by inspiring of systems like Pond and Ricochet. Deniability : The messages sent do not have digital signatures that are checkable by a third party. Anyone can forge messages after a conversation to make them look like they came from you. However, during a conversation, your correspondent is assured the messages he sees are authentic and unmodified. Perfect Forward Secrecy : Even if you lost your private keys and they are stolen by someone, your conversation cannot be decrypted. You can find a list of Software/distribution that use OTR here. You can download for free Tor Messenger here. Please be sure to click firstly on the most recent version. After that, you can find various downloads corresponding to your distribution and architecture. Tagged anonymous, chat, confidentiality, tor.